If you are short of time, the answers to the following 3 questions should let you know all you need to about the Oral-B Stages Power Disney Dory Electric Toothbrush. If I have missed something, let me know in the comments. If you want more detail, you can read our full Oral-B Stages Power review further down the page. Designed with children in mind, there are bold bright colors and a number of features that work well to encourage good brushing habits. The Stages Power is a good brush, it takes the second spot in our article, best electric toothbrush for kids. However, the Sonicare for Kids connected electric toothbrush is overall a better option for the long term in our opinion. It engages children a little better, thanks to the Bluetooth connectivity to the associated app, as well as offering better battery life. 3. Where’s the best place to buy the Oral-B Stages Power? Oral-B offer a few different styles of electric toothbrush for kids. The Pro Health Jr is another popular option. However, this Stages Power reviewed here has the bolder colors that really engages kids. Couple that with images of popular Disney characters and the associated app, then you have a strong foundation to get kids brushing regularly and for the right amount of time. A few variations of this electric toothbrush exist. The design and color of the brush handle remain the same, as do the the technical features of the brush. The difference however is the Disney Character that appears on the brush head and the packaging. It is the ‘Dory’ variant that is most widely sold. You can however always buy the different brush heads separately to change the theme of the brush. What are the pros and cons to the Stages Power electric toothbrush for kids from Oral-B? Design – Bold colors and popular Disney characters. Grip – It’s a bold yellow color and wraps around and down the brush handle, making it easy to hold in hand. Timed Clean – A 2 minute timer is built into the handle, along with a 1 minute pacer that plays melodies to encourage children to brush both upper and lower teeth. App – The accompanying smartphone app provides an interactive and reward based experience to encourage longer brushing. Battery life – Up to 5 days life or 20 minutes of usage time which is weak in comparison to what is possible today. Lack of Bluetooth connectivity – Despite an accompanying app no direct communication between the brush and the smartphone. As with most electric toothbrush, there are 2 key parts, the brush head and the brush handle. In some instances they are fixed together, but in most they are separate, as is the case here. The reason they detach from one another, is to allow for replacement of the brush head. Children and adults, should replace the head of their electric toothbrush every 3 months on average. If the bristles are frayed or split, showing signs of wear sooner than this, you should not wait, replace them sooner. Failing to do so can cause damage to the teeth and gums. Blue indicator bristles within the brush head will actually fade to a very pale Blue, almost transparent colour when they need replacing. The heads simply slide on and off the handle over the metal shaft that protrudes from the handle itself. Specifically designed for children, the brush head supplied here is slightly smaller than that of a regular adult brush head. The bristles are too less densely packed and they are ultra-soft. Circular in design, the brush head has a series of tufts, that contain many bristles that will provide effective cleaning to the teeth. The small round design is Oral-B’s oscillating approach. The brush head moves side to side in a circular motion very quickly. The fast movement ensures plenty of passes over the tooth surface to dislodge and remove plaque and food particles residing on and in between the teeth. Red in color is the plastic body of the brush head, the neck of the head is wrapped in a sticker that is Disney Themed. Themes and popular Disney characters found here include Dory, Nemo, Frozen and Cars, amongst others. 1 is supplied in the box, but replacement packs can be purchased. You can change the theme or features character as you change brush heads. Pricing and availability of these heads differs quite considerably. They can cost as little as $5 each, but expect to pay around $10 per head or $20-$30 for a 2-3 packs of replacement heads. It is possible to use any of the standard adult brush heads on this handle if you choose. With these heads you get more choice, but be considerate if and when you do this. For the most part the small soft bristled heads are best for children. You can use this brush with children aged 3 and above. Do ensure you supervise brushing until they are independent enough to brush correctly on their own. Most parents find this to be around 7 years of age. So, the brush handle then. A rather bright colored unit, the bold Blue, Red and Yellow color scheme certainly catches your eye and is of interest to those precious little ones. The main handle is Blue in color. On the front is a sort of teardrop shaped rubber panel that contains a slightly pronounced circular power button. The colors contrast and draw attention for Kids. Around the top of the brush handle and stretching down the back and sides is a vast expanse of Yellow rubber. The images show it best, but it sits proud of the main plastic body and looks like melted wax might had it been poured on the handle. It is very grippy and in the middle of that grip, on the back is a further ridge that aids with holding in hand but also stops the brush from rolling around it laid on a worktop. Oral-B have done a nice job here to make it easy to hold for kids, even when the brush or their hands are wet and perhaps covered in toothpaste. Towards the base of the brush handle, on the front is the Braun/Oral-B logo and a battery status indicator that gives feedback when charging. There is too a Red colored ring to the base of the handle. On the base is a recess into which the charging pin of the provided charging stand fits. The brush is powered on and off by a press of the Yellow button on the front of the brush handle. When powered on the built in battery sends power to the brush motor which in turn drives the bristles on the brush head. The head will move 7,600 times a minute. It is at this point that the built in timer kicks in. The timer runs for 2 minutes, the same time that dentists recommend you spend cleaning your teeth. At the end of the 2 minute cleaning cycle there are a series of brief pauses in the brush head movements. If looking at the brush head you will see this. You will too hear a change in the sound the brush makes. There act as a signal that the time has passed and the child can end the clean. A much loved feature of other brushes, that is missing here is the 30 second pacer or quadpacer as it is known. I won’t explain it in detail, most are familiar with it. For kids in particular it can be a valuable tool in teaching them how to brush their teeth evenly and thoroughly. However, whilst its not built into the brush, it is built into the Disney Magic Timer app. More on that in a moment. Despite not having a pacer, it does have a 1 minute timer built in. Explaining and getting kids to understand the 4 quadrants to the mouth can potentially be a challenge, particularly with younger ones. Therefore making sure they brush, top and bottom is an alternative teaching method. To try and bring balance to the clean, the brush at 1 minute intervals plays a little melody. That melody changes, there are 16 different ones in total. The idea is, that as your child brushes, they begin with their top teeth, then they hear the little tune at 1 minute. They then begin brushing for a further minute on the bottom teeth until the 2 minute cleaning time is up. It is a nice touch and another interactive element to this brush. Turing the brush off at the end of the 2 minutes is required, it will not do it automatically like some others do. So, the Disney Magic Timer app then. It is pretty clever in what it does and what it offers. It can be downloaded for free for Android and iOS. Once loaded on the phone, you scan the brush/packaging using the phone’s camera and it intelligently detects what theme to apply to the app. Different themed brushes get a different themed app experience. A simple and easy setup process, a nice touch is that you can set up different user profiles. So for example if you have 2 children and each has a different brush with a different theme, the app changes that theme as and when you load into each child’s profile. The idea is that the app is used at the same time as brushing. On screen there is a countdown timer, an upbeat song is played and graphics are slowly revealed as the child brushes. Providing they brush for the full 2 minutes then the graphic is shown in full and a reward is then gained. This is added to a virtual sticker book. The principle is that the child is motivated by getting the stickers in the book. Completing the book is only achieved through regular brushing. The app keeps a log of how often the teeth are cleaned via an on screen calendar too. Even if you have a super proactive child who tries to brush too often, the app says that you have brushed already and you should do it again in the evening or the morning. Simple, yet effective steps that encourage and teach good hygiene habits. As this countdown timer is shown on screen it does also make it clear to the child that they need to move the brush about the mouth to get all the teeth. Where the brush lacked the 30 second pacer, the app makes up for it thanks to the animated graphics. A very important thing to note is that the brush does not have, nor does it pair to the smartphone by Bluetooth like some do. What this means is that the brush and app are not in sync. So in theory, the app could be counting down but your child not actually have the brush switched on and be brushing. If you are supervising you will know this, but for those independent brushers, just make sure they don’t try to fool you. The app works and is engaging, but as a parent you might have concerns about having to use or hand over your smartphone as the kids brush their teeth. Ideally the phone needs to be positioned in a way that child can see the screen whilst keeping the device away from danger. Some sort of holder would be nice, but this is not included. I understand if you have concerns about giving your child a smartphone to use whilst brushing. This is where supervision can be useful. Other nice touches within the app include tutorial videos for kids too. Of course the results of this brush vary from child to child and how motivated they are by this sort of approach. Our own hands on testing suggests that most children love this and find brushing much more enjoyable and more importantly, brush for longer. This whole package works well together to encourage a better brushing routine for your child. The brush handle itself is water resistant and is designed to survive everyday use, exposure to water, toothpaste, and saliva. The handle should not be immersed in water though, so whilst a rinse under the tap is fine, a trip in the bath is not. Sealed, the battery and motor inside the handle cannot be accessed or replaced. It will offer 20 minutes or 5 days of brushing between charges. The brush comes with a 2 year warranty and will likely continue working longer than this, but you have that peace of mind. Oral-B suggest that you will get 5 days between charges. In fact in our hands on testing, we managed to get more than the expected 20 minutes of running time. Whether we were lucky, because the brush was new or what, I am not entirely sure. We achieved a maximum of 11 days, or 44 minutes of usage time. That is double the expected. Don’t expect to get that yourself, I wouldn’t want to give a false impression, but at the worst you should expect 5 days. This is well below the 14 days on offer by Sonicare as a minimum run time. They do use different battery technology, which probably plays a part. Either way, for peace of mind and convenience you might want to get your children to just put it on the charging stand when not in use anyway, that way you don’t have to worry. It is perfectly fine to leave it on the stand. Supplied in the box, it is White in color and has a 2 pin US power adapter hardwired into it. Supporting 110-130v it is designed for use within the USA. If you are travelling overseas, where voltages and plugs are different, make sure you research to ensure you have the correct adapters. When it is connected, the toothbrush sits upright on the charging stand, with the prong on the stand fitting into the recess on the bottom of the brush. A light on the handle will flash Green to indicate it is charging. When complete the light will stop flashing and go out. If the brush is completely flat, it will take up to 22 hours to charge it fully. If you already own an Oral-B electric toothbrush, this is the same charging stand that is supplied with other models, notably those for adults. So you need not have different charging stands in the bathroom if you and other members of the family are using the bathroom. The actual price you will be asked to pay for this brush does depend on the retailer you are buying it from. The suggested retail price is $39.99-49.99. At the time of review there were sellers offering it at both ends of this suggested price scale, but no significant discounts were available that I could see. The lowest price I could find it for was just under $40. We have included a live comparison table here at the start of the review. Brush heads need to be replaced every 3 months on average and they will normally cost about from about $5-10 each and come in a pack of 2 or 3. Here at Electric Teeth we like to work out a rough average cost to purchase and own electric toothbrushes. With a typical working life of 3-5 years, we work out the cost over the lower 3 year period. Using the average cost and ownership over 3 years, the Stages Power electric toothbrush will cost $122.50 ($40 for the brush + 11 brush heads at $7.50 each) or $0.11 per day to own. This price is not terrible, but its not as cost effective as the Pro Health Jr and very similar to the Sonicare for Kids Connected, which I think is the all round better electric toothbrush. Children have a tendency not to be quite so delicate with their possessions as us adults are. Therefore the Stages Power needs to take a few knocks and falls and it feels like it will. An overall solid construction, the vast expanse of Yellow rubber grip, helps keep the brush firmly in the hand of the child. With the electronics sealed inside potential water damage is limited. Years of manufacturing experience has allowed Oral-B to produce a pretty solid brush. Our hands on testing gives us no real cause for concern in regards to the reliability and ongoing performance of the brush. Our testing is by no means scientific and we put the brushes through nothing other than daily life tests. Brushes do not undergo durability and stress testing. The nature of the electronic product does mean that they can fail at times and some users have reported faults. With a 2 year warranty Oral-B are there to support and assist should things go wrong. 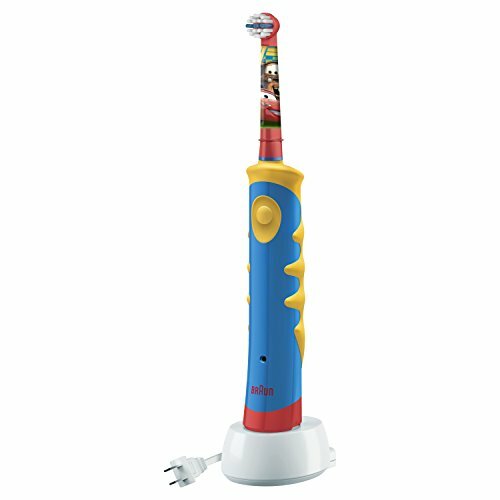 The bold colors, Disney Theme, timer and app all work towards making this a great electric toothbrush for kids. It is engaging, it encourages and is simple to use. It is relatively well priced and kids seem to love it. And of course, the power of the motor does a good job of cleaning the teeth whilst providing a soft brushing experience that will not damage the delicate teeth and gum of your little one. There is little to fault, my biggest criticism is the battery life at just 5 days or so. By no means a bad brush, you really should consider the Sonicare for Kids Connected toothbrush from Philips. Similarly priced, I feel it is a better all round solution and although it lacks the popular Disney theme, it makes up for it in execution and everyday usability. Ergonomic handle designed for children's small hands. Is the Stages Power an oscillating brush? Provided with a Disney themed childs brush head, the bristles are softer and less dense than an adult brush head. There are a range of different themed Disney heads that can be attached to the brush handle. It is also compatible with the adult range of interchangeable brush heads, if desired. There include Cross Action, Floss Action, 3D White, Sensitive, Precision Clean and TriZone. It is however best to stick to the Sensitive brush head for kids. Does the Stages Power have a pressure sensor? Does the Stages Power have Bluetooth? Does the Stages Power come with a warranty & how long is it? If purchased new from an approved retailer the Stages Power will come with a 2 year warranty. Does the Stages Power have a built in timer? Yes. It has a timer which vibrates as the 2 minute daily cycle has been completed. At 1 minute intervals it plays a melody to alert the child to change the area of the mouth the focus on. Yes, a charging station is included with the Oral-B Stages Power. The Stages Power charging station has not been designed to be fixed to a wall. Can I use the Oral-B Stages Power in the shower? Yes, it could be. It is water resistant. Avoid complete submersion in water. Ideally you should be supervising your child when brushing rather than them using in the shower. Do you own or have your children used the Oral-B Stages Power? Are there certain features that you or your kids really like or dislike?